Things have been a bit nuts in the “Watch Me Juggle” household. 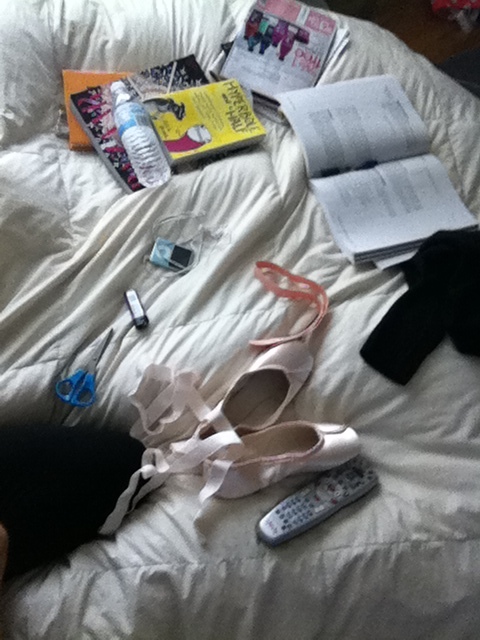 My bed, as you can see, has become my work space as of late, accumulating clutter as I dash about. I captured a quick moment before running off to rehearsal, with my shoes not yet sewn, my CBEST test-prep book open, and an embarrassing collection of half-drunk water bottles strewn around. Last week, although productive, seemed to drag on forever. First off, I took (and passed) my CBEST last Wednesday. While called the California Basic Educational Skills Test, I have to say, this exam was somewhat infuriating. I took a number of practice tests, and occasionally scored higher in the mathematics section than reading, which is astonishing for me. I found myself often over-thinking multiple choice reading comprehension questions, debating between choice “A” and “B,” because both could technically be correct, and who are we to assume to know what the author of the passage is trying to say from a stylistic standpoint?! Frustrating, to say the least. I also spent more time than necessary on my two essay questions, and in the end I liked my responses so much I’m hoping I can somehow get my hands on my writing from the test people. Test aside, now I am trying to navigate applying for a substitute teaching permit in Alameda County, which, in all honesty, I thought would be a little more straightforward. I’m incredibly lucky in that I have numerous friends that have had to jump through the same hoops (and have done so successfully) that can help me out. And there’s always Google.